The Weathermaster 3-room tent lived up to it's weatherproof billing, by and large. On one trip we had several days of constant rain, and we didn't get wet inside of this tent. The only part inside the tent that got wet at all was a little stretch of floor near each window. The reason it got wet is because the rain fly doesn't offer 100% coverage over the windows, it's more like 95%. The floor didn't get very wet in those areas, but it did have some drops of water on it. 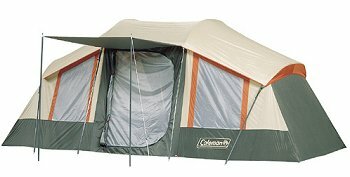 The Weathermaster can be used as a one-room tent or can be turned into a three-room tent by using the hanging dividers. When used as a three-room tent, the side rooms are 6x9 feet and the middle room is 5x9 feet. There are four windows and a door, all of which can be zipped or unzipped. There is plenty of standing up room in the tent, as the center is 6'4". The Weathermaster is very simple to set-up. With a little practice, one person can set it up without much problem. All of the tent poles are color-coded so there is no mistaking or confusing them. The most difficulty I had with anything was in getting the rain fly all the way over the top of the tent, but it wasn't too hard with a little practice and creativity. If you ARE having difficulty with set-up, just reference the instructions, they're sewn right onto the carrying bag. While the manufacturer says it sleeps 8, I would say that it probably sleeps 6 comfortably, and that's without much luggage or anything other than sleeping bags and bodies. On a hunting trip, 2 hunters each with a lot of gear will fit comfortably into the tent. More than that and it would become crowded. When set up properly the Weathermaster is extremely sturdy and rigid. We had some fairly high winds while testing it out and never felt a moments uneasiness that it would withstand the weather. I did have some gripes with this tent, nothing major, but annoying all the same. As I mentioned above, the rain fly didn't cover the windows 100%. If you're camping in the hot summer, you need the windows open. If you're sleeping with your head right up against the window and it's raining, you might get a little wet. The sewn-in floor material wasn't quite as tough/thick as I would have liked either. Unfortunately, not everyone has the luxury of camping at established camp sites on flat, smooth camping "pads". This was the case with our camping location when testing this tent. We had to clear an area and, as we found out later, there were a few 1/4" or so thin sapling butts still sticking up out of the ground. When set up, the tent floor is very tight and rigid, and with some amount of activity inside the tent, inevitably one of those thin sapling butts broke through the flooring material. In a lot of locations, this might not have been a problem. It WAS a problem for us, though, because it was necessary for us to have our food inside the tent, and in Texas (where we did our testing) there are Fire Ants. Fire Ants love food, and they love to sting people. It was no fun for awhile as we tried to figure out how to get rid of the Fire Ants. We ended up taking some package tape and taping over the two areas that had been poked through. That helped some, but didn't eliminate the problem totally. My biggest complaint, although easily remedied, is that the tent stakes provided by Coleman with the tent were those cheap yellow plastic ones. These stakes might work in really soft ground. They are no good for hard ground, though, and worse than useless for rocky ground. All of the areas that we tested this tent out in happened to be pretty rocky ground. They just don't have any "drive" and I've actually had them break in half hitting them at the "wrong" angle with my mallet. Fortunately, I always carry a dozen or so of the heavy duty metal stakes, and I used them as a replacement with no problem. Lastly, it was impossible to sweep dirt, crumbs and such out through the front door of the tent, because there was a "lip" at the door that was higher than the level of the floor. The only way to clean it real thoroughly would be with a dirt devil type of vacuum. Overall, I would definitely recommend this tent as a good, sturdy and weatherproof one. I do believe with a little effort Coleman could make some good improvements, though.